GILES PARKINSON. Bad news for coal-huggers: Renewables at 50% by 2030. “King coal to rule for 20 more years” screamed the front page lead headline in The Australian, following the release of the Australian Energy Market Operator’s 20-year blueprint for the future of energy, known as its Integrated System Plan. Hate to say this guys, but that’s not what the AEMO report says. Here’s the thing: AEMO’s blueprint makes it absolutely clear that even if current climate and emissions and policies are not changed, then the shift in generation is going to happen anyway, and quickly. 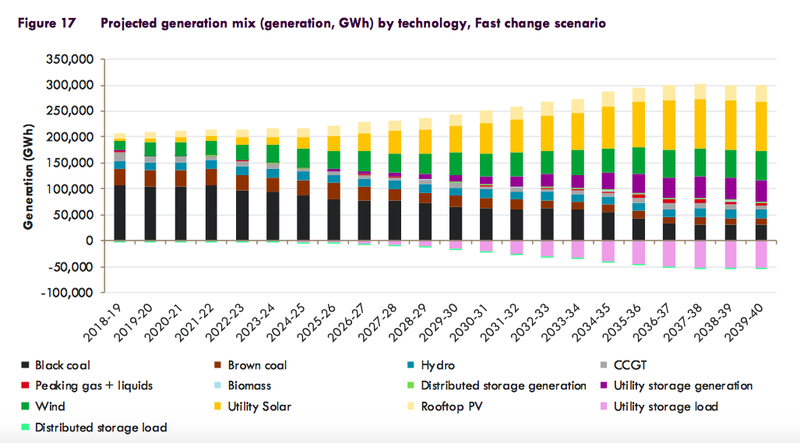 This graph above shows that by 2030, based on the Coalition government’s existing policy and the various state targets in Victoria and Queensland, black and brown coal contribute barely 100,000GWh, and the share of renewable energy will be nearly 50 per cent by 2030. That so happens to be the same as Labor’s renewable target, and the level that the Coalition government describes repeatedly as “reckless”. AEMO says it is unequivocally the cheapest path, and one that will keep the lights on. This scenario takes into account AEMO’s modelling that allows for existing coal fired generators to continue operating until the end of their technical life i.e. 50 years. But contrary to the claims of conservative commentators, it does not recommend they be kept open for longer. That’s because the combination of wind, solar and storage will be cheaper, as AGL has highlighted. So, by 2030, out of the system have gone Liddell (2022) and Vales Point, both in NSW, and Gladstone in Queensland. It does not rule out this happening earlier, either due to the inability of the coal generators to make money, or catastrophic failure of their machinery. In the 2030s, Yallourn, Eraring, Bayswater, Tarong and Callide are gone. By 2040, the “rule” of King Coal is but a memory. Like the National Energy Guarantee and the Australian Competition and Consumer Commission report, the central scenario of AEMO gives no regard to climate change policies, the need to accelerate targets to ensure that Australia does its bit to meet the Paris climate target. Where it does, the outlook is even bleaker for “king coal”. Renewables have a much greater share of generation – going towards 60 per cent. This graph above shows the “fast change scenario, and shows that the combination of black and brown coal and gas generators account for less than 100,000GWh out of total grid demand of around 250,000GWh. And that “fast change” scenario is further complicated by other factors thrown into the mix – the assumption that consumption grows faster than the neutral scenario, that EV uptake is greater, less demand management, and the roll-out of rooftop solar is not co-ordinated. So the end result could be even more bleak for the coal-huggers. A fast-change scenario that dials in appropriate climate change policies, co-ordinates distributed energy, promotes demand management could actually see more coal out of the system earlier. But that detailed modelling would just be too scary for some – best to keep it in the adults-only section. Or not to publish it at all. Update: Little wonder that Labor’s Mark Butler was impressed, saying in a later statement that the IPS “vindicates Labor’s renewable vision” for Australia’s energy future. “The AEMO report confirms that the future of energy in this country is renewables,” he said in a statement. “It confirms that coal will stay in the mix – as we have always said it would – until it is phased out and replaced by cheaper renewable energy, and it confirms that there should be no new investment in coal. “Just like Labor, the energy industry, experts and the Australian public, AEMO understand that the energy future of Australia lies with renewables. 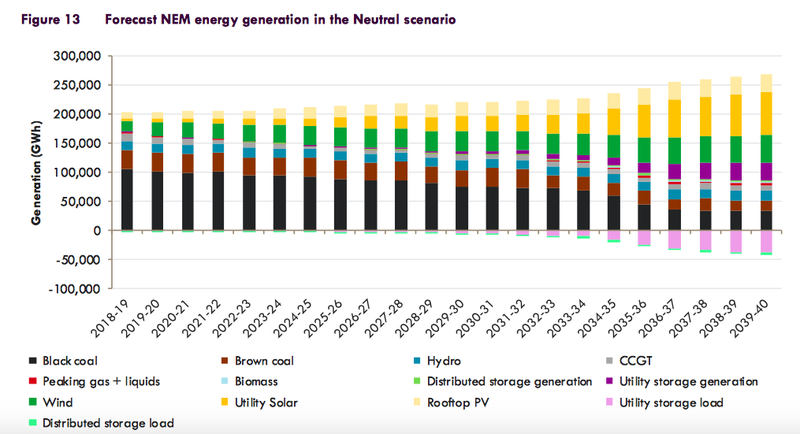 “This is placed beyond any doubt by AEMO modelling, which shows renewables making up 46 per cent of NEM generation by 2030 in their Neutral scenario, and 61 per cent of generation by 2030 in their Fast Change scenario. The Greens also noted the pace of transition, observing that just 6 coal fired generators would remain in the system by 2040. “The government wants to spin this coal’s way, but once again AEMO has shown that the future is cheap, clean renewable energy”, climate spokesman Adam Bandt said. This article was published by ReNew Economy on the 17th of July 2018. One Response to GILES PARKINSON. Bad news for coal-huggers: Renewables at 50% by 2030. More fake news from the COALition.